makes collaboration easier, as users can discuss a document while they work on it—without leaving the document itself. 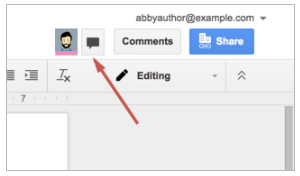 As many of you know, the current Docs Editors chat functionality is built on Google Talk, which we previously announced will be shutting down at the end of June. If you currently have the Hangouts service enabled but Talk disabled, chat in Docs, Sheets, and Slides is not available to your users at this time. After June 7th or 21st (depending on your release track), however, your organization will begin to be able to use chat in the Docs Editors. * We encourage you to communicate the new feature to your users ahead of time. There will be no in-app promotion; users will simply see the chat button below appear in Docs, Sheets, and Slides when collaborators are in the document. If a user clicks on that button, a chat window like the one below will appear on the right side of the screen, allowing him or her to chat with others in the document. We’ll be making further improvements to chat in Docs, Sheets, and Slides in the future, so stay tuned for additional updates. *IMPORTANT: Please see the Help Center for a list of exceptions. 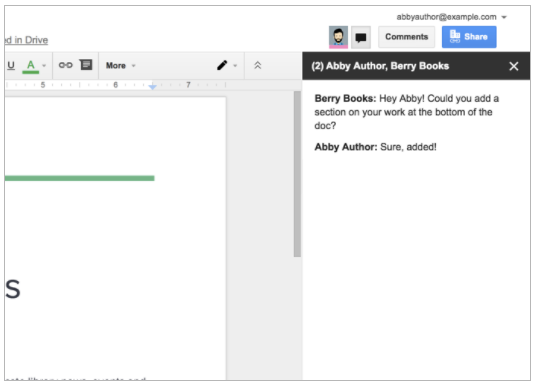 Chatting in Google Docs, Sheets, and Slides makes collaboration easier, as users can discuss a document while they work on it—without leaving the document itself. As many of you know, the current Docs Editors chat functionality is built on Google Talk, which we previously announced will be shutting down at the end of June.